Caption slip reads: "Photographer: Sandusky. Date: 1953-01-24. Assignment: Beach pix -- Muscle Beach. 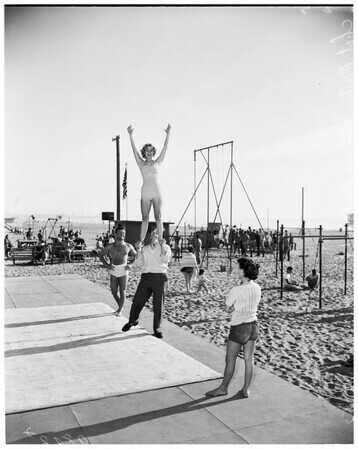 D25-26: Chet Mastin of Santa Monica carrying Barbara thomason, 16, of Inglewood. D27-28: Same girl & Stan Fried of Burbank. D29-30: Same as 27, 28, add Stan Turner of Santa Monica on top."